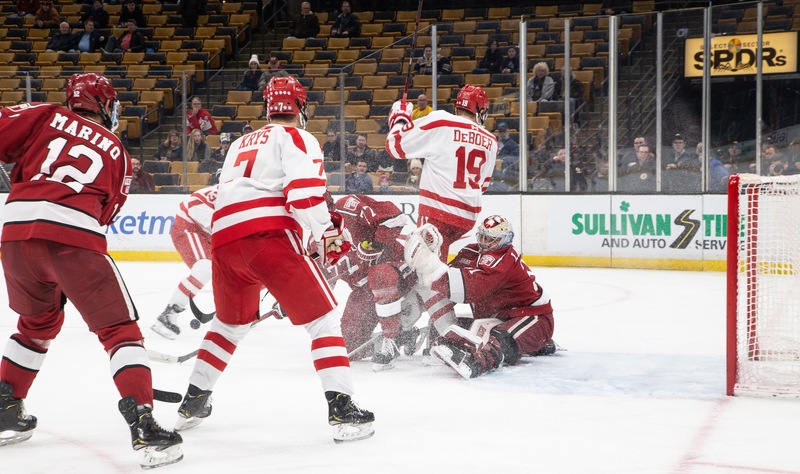 The Boston University men’s hockey team dropped its fifth consecutive game on Monday night, falling to Harvard University 5-2 in the consolation game of the 2019 Beanpot. We wanted a nice game of shinny, and [Harvard] wanted a real game of hockey,” said BU head coach Albie O’Connell. The two sides would remain scoreless after the first 20 minutes. Harvard (13-7-3, 9-5-2 ECAC) attempted 31 total shots in the period, but BU freshman goaltender Vinnie Purpura, making just his second start with the Terriers, was up to the task for the 12 shots on target. BU (10-14-3, 8-7-2 Hockey East) only tallied five shots on goal in the opening frame, but the Crimson were able to block 11 Terrier efforts, to their credit. Still, the discrepancy in terms of shots, especially early, continues to be a concern for BU. The lopsided offensive play continued into the second period, with the Crimson leading in shots on goal by a whopping 32-14 after 40 minutes. As the opportunities piled up, Harvard were eventually rewarded for their persistence. Nearing the halfway point of the period, junior forward Frédéric Grégoire drew first blood on a rocket from Purpura’s left that snuck in under the bar. The assists were credited to junior defenseman John Marino and sophomore defenseman Reilly Walsh. Walsh was involved in the second Crimson tally seven minutes later, receiving the puck from junior forward Colton Kerfoot and feeding it to an uncontested Jack Badini outside BU crease. The sophomore forward converted easily, and Harvard held a 2-0 lead at the second break. “It wasn’t a good first period, and the second was even worse,” said Coach O’Connell. The game opened up in the third, starting with BU finally getting on the board six minutes in. A driven pass by sophomore defenseman David Farrance at the blue line was knocked centrally by freshman forward Joel Farabee, where fellow forward Patrick Curry tapped it in. The goal was the junior’s tenth of the season, and cut the Crimson lead in half. “I thought we played pretty well for stretches of the third,” said the first-year BU head coach. BU could not capitalize on the momentum of Curry’s tally, as Harvard restored the two-goal lead at the 12:28 mark. In 4-on-4 play, a trio of Crimson attackers flooded the BU zone, and it was Grégoire who drilled one past Vinnie Purpura for his second goal of the game. Purpura would vacate the Terrier net in exchange for an extra attacker with just over three minutes left, but Harvard defenseman Adam Fox took no time to quickly toss one in from distance to extend the lead to three. It was the 100th point of the junior’s career. Junior forward Gabriel Chabot got one back for BU with less than two minutes to play off of passes from freshman forwards Mark Cheremeta and Jack DeBoer. After striking the post with an initial effort, Chabot would corral his own rebound and slot it past Michael Lackey for the first goal of his junior campaign, and his fifth as a Terrier. 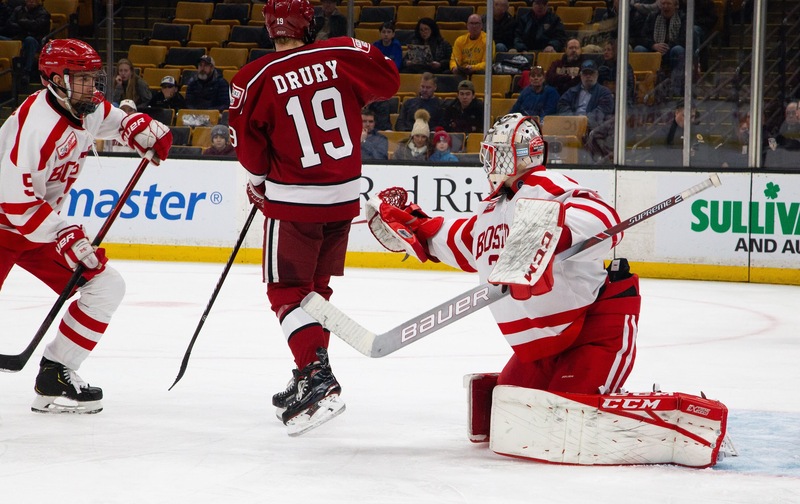 With the BU goalie pulled again, the Crimson would have the last laugh, as freshman forward RJ Murphy made a slick move to find space and walk the puck into the Terrier net with 43 seconds to play. The game would finish 5-2 in favor of Harvard, meaning that after four consecutive appearances in the Beanpot final, BU would finish in fourth out of four teams in this year’s tournament. “You can’t play a D1 hockey team and expect to win when you don’t show up,” said O’Connell. Harvard attempted an astounding 76 shots in the contest, including 39 on target. As has been the case for BU as of late, the Terriers simply could not match the opposing offensive output, tallying just 42 shots of their own with only 26 reaching Lackey between the pipes. Still in search for their first win since January 25th, BU now turn their attention to the seven Hockey East fixtures remaining to conclude the regular season. This stretch of conference clashes will begin this upcoming weekend, as BU will travel to the University of Connecticut for a 7pm puck drop on Friday the 15th, and then host the same Huskies the next night at 7pm as well. 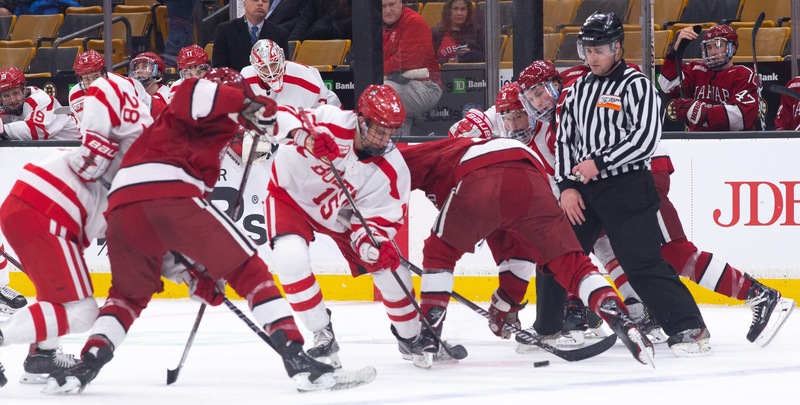 Boston University falls to 10-14-3 with 5-2 loss to Harvard in Beanpot consolation game. Terriers have been outshot in 8 of last 9 games. Hard to believe for a team dressing 10 NHL draft picks among its skaters. need i say anything more. But we are great. Great. Get it , great. I don’t put a lot of stock in what Jeff cox reports these kids are young and raw. Just because they are drafted does not make them great college hockey players just the same if a guys not drafted does not make him a below average college hockey player. Two of our best players are not drafted look at Curry and Amonte they make the most of there opportunities. Yesterday is hard to judge it meant something to Harvard in national standings but had no effect on our position. I would have played max yesterday personally. Let me make it clear since I seem to be sunshine on commonwealth ave this team has holes but they can turn things around this year if they don’t rest assured coach will take care of it in the off season. Coach is not passive he is the best coach in the country I’m giving him plenty of leeway when it comes to getting the right players in here. No one has quit everyone hustles but are they playing coaches style of hockey or some hybrid style is this because they are young or is it because they think they know better. I’m not sure if this can be fixed this year or may take a few but this team does not need to be blown up guys just need to understand what being a terrier is about. I’m still holding out hope for this year we can still do great things. I have a lot of faith in our captains as well. God Lord, Colin. Do you watch the games at all ?? We have given up. YES, blow up the team. Vinnie via cox is so right. Take FEW years to correct ? Are you serious ?? There will be no one in the BU stands if this not caring hockey team continues. But the passive, far left, BU administration does not care. Play “Peter Gunn” one more time and file to the cemetery. We are dead. So SoCC, you’re blaming our so-far disastrous hockey season on the politics of the BU administration? Seriously?? Colin, how can you say that coach is the best in the country? What are you basing that on? I’m sure he too is a good person but his record doesn’t support your statement. He does deserve more time so no one should be jumping to any conclusions yet. But let’s also be real here. He is the coach of a team that was ranked high in the preseason, has an overall losing record, and is on a 4 game losing streak. He does bear a lot of the blame here. TK out! Can we now agree recruiting the top talent whose primary goal is to play in the NHL is an abject failure.? Especially when they refuse to compete. I like Albie but does he have a pulse? The coaching staff reminds of a cross between the three Stooges and Laurel and Hardy. Every time they call a time Out the opponent scores and every time the opponent calls a timeout B.U. Gives up a goal. The worst power play in college hockey. Reminds me of a figure skating team. It would be funny if it was not so sad. Please keep all sharp objects away from Colin and Glenn. Bet dollar Dave is laughing all the way to the bank . Perhaps he owns the bank. I’m not at practice I don’t know what is going on behind those doors. I do go to almost every game. I understand hockey what I see on the ice is kids skating hard but not playing a cohesive team game. Sometimes when a team is struggling individuals start to get away from the basics. In that last U mass game I saw guys hustle back on a back check just to stop and watch so they have not quit (that’s the most important thing to me) yesterday’s game we consistently turned away from the puck we never looked to headman the puck. It looked bad now again is that kids struggling to figure things out or is it young kids thinking they have the answer . I have faith in coach to figure out what the answer is and if some of our first round guys need to go so be it but that’s not up to us on this blog we don’t know what’s going on. To answer your question of how I know coach is great. That’s easy he has been around a long time involved in many programs everywhere he goes he makes the programs better. Every college scout I come across and I come across a bunch says how much they respect him. Whenever I have spoken with coach I’m so impressed with his knowledge of the game. Again we need to give this coaching staff a break it’s year one not much different then when coach Quinn stepped in . Coach O’Connell will straighten this team out and who knows we can still turn it around as early as this year. My message to the team would be keep it simple win each shift break the game down by shifts win shifts win confidence that’s what this team is desperate to find confidence. as ridiculous as it sounds that coach Albie is the best coach in college hockey, which i don’t think Albie would agree with, can we all agree that Mr Colin is the most bestest, most superest fan of all time. Glen, I have to get a political shot in everywhere I go about BU. Their left leaning to the extreme has made me the laughing stock of my peers. I get hammered about the complete nut from BU elected to congress who sounds like she never got out of High School never mind BU. And yes, the passive attitude of this extreme left brings a weak submissive to the team. You can see it. Ah … I see! Thank goodness BU had a right-leaning administration in 2009 when we won that last NCAA title. I agree with your assessment. The Congress women makes no sense. Perhaps she should visit or live in Venezuela. The team is beyond pathetic and an embarrassment to any former player , fan or any one ever associated with the Hockey program. The most overrated, under achieving selfish group of individuals in college sports. No leadership, the top six forwards and top four defenseman have regressed and play as individuals not as a team. Apparently tuned out the entire coaching staff, waiting for the season to end. This is not about the politics of the administration. Let’s keep this blog about hockey. This season is in jeopardy. They almost have to win out. While not convinced about the coach, even I know that he deserves another season. Some of the players have been reading their press clippings as evidenced by their play recently. Colin, I’ll take your word that the players are good people but some of them are not on the pedestal on which you have placed them. TK out.